thus threatening tampa's cruise port. links could be broken at any time. 1) do nothing and only port ships that fit under the bridge. 2) build a new port seaward of the bridge. 3) build a drawbridge and new channel at one end of the skyway. 4) remove the skyway and build a tunnel under a new shipping channel. 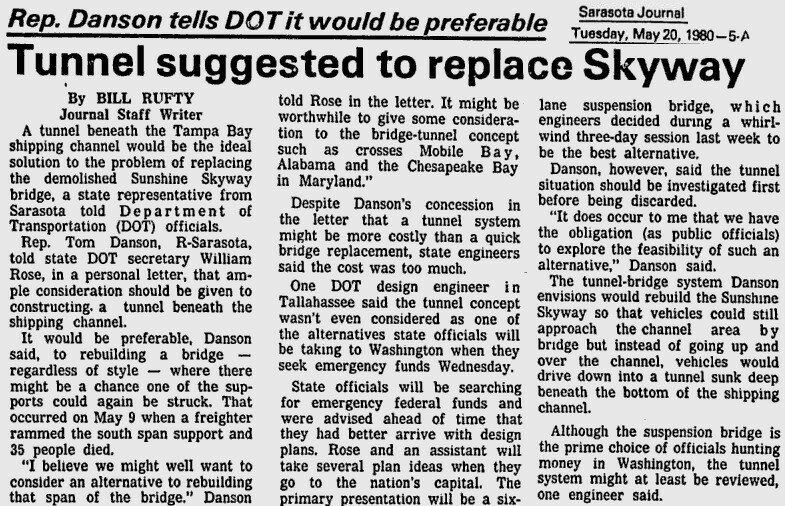 08.10.14: al.com, mobile alabama refers to the skyway dilemma for building new bridge. 07.08.14: the entire 46 page fdot cruise pre-feasibility study. 12.08.16: Port Tampa Bay Releases Master Plan ‘Vision 2030’. 12.08.16, cruiseindustrynews.com, Port Tampa Bay and its consultants today unveiled the port’s master plan “Vision 2030,” which outlines the port’s development plans going forward. Port Tampa Bay said in a prepared statement that it periodically reviews and updates its short- and long-range plans for growth and business development, in order to keep in step with the economy and forecasts that cover an array of factors that impact the port’s diverse business lines, which include cargo, cruise and real estate activities. The master plan provides a road map that underscores opportunities and challenges in building and maintaining a thriving, world-class seaport. 7) Develop and implement a landside transportation access strategy. For the cruise industry, according to the plan, Port Tampa Bay’s vision is to develop world-class passenger facilities and services optimizing the cruise experience and preserving significant cruise-related economic benefits for the community. Thus, the port wants to maximize its attractiveness to the industry , while fully integrating its cruise facilities and services with the redevelopment of the Channel District. The plan calls for an investment of $148.5 million from 2017 through 2021, including redevelopment of terminals, road access and parking. According to the plan, the port will also look at long-term solutions to serve the next generations of cruise ships. Cruise ship traffic is presently limited by the 180 foot air-draft restriction imposed by the Sunshine Skyway Bridge. In the current fleet of cruise ships, vessels with an air-draft of 180 feet generally carry between 2,000 and 2,500 passengers. But ships being commissioned or on order are significantly larger. Therefore, the port will concentrate on the niche market for less than 2,500-passenger ships in the longer term. At the same, the plan calls for evaluation of possible solutions to the bridge air draft constraints to accommodate larger cruise ships. Today, the cruise traffic is approaching 900,000 passengers and is expected to peak at 1.3 million in 2020, and could drop thereafter as older and smaller cruise ships are replaced by new and larger vessels. However, removing the air constraints could bring up to 2.9 million passengers to the port by 2043, according to the plan. Recently, the port also announced the results of an economic impact study, which showed the port’s annual economic contribution of $17.2 billion to the regional economy. Additionally, the port said it is responsible for about 85,000 direct and indirect jobs. It said it has traditionally been one of the largest economic engines in West and Central Florida, and indications are that this will continue well into the future. 11.04.16: Why mega cruise ships may never sail into Tampa. 11.04.16, wtsp.com, Looking to set sail on a cruise out of Tampa? It's not going to be on a mega ship anytime soon - if ever. Taxpayers forked out $150,000 dollars for the Florida Department of Transportation to study possible options to bring the bigger ships into the port that are now limited by the Sunshine Skyway bridge. Two years later, nothing has been done with those recommendations. In order for the mega ships to get into Tampa Bay, FDOT recommended a new bridge, raising the existing one or building a new cruise facility on the other side of the bridge. So far, leaders have gone with option 4: Do nothing after looking at costs and inconvenience to drivers who use the existing bridge. “We need the big ships," says cruise passenger Tom O'Neill. "We want to compete with Miami. It's too far to drive. "Tampa needs to compete, so bring on the big ships." 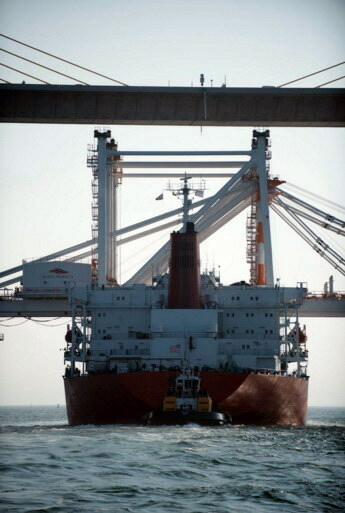 O'Neill wants the local convenience of the mega ships that are kept out of the bay right now because of the Skyway. “For Tampa to be a Top 10 market, they're going to need that bridge to come down,” he says. The FDOT study estimates that a new Skyway would cost $2 billion and take four years to build. To raise the bridge, it’s a $1.5B price tag, in addition to closing it for up to two years and impacting thousands of drivers. “It's like this much space to (drive) through. That's a lot of people you're inconveniencing for a long time,” says Tampa resident Marvelle Smalley. But what's taken so long to decide? FDOT passed the study on to the port two years ago. The port tells 10News it's up to area leaders. So, 10News went to talk with Tampa mayor Bob Buckhorn. When asked if the study was a waste of money, he responds, “No, you don’t know until you do the study." Buckhorn believes continuing to cruise along with the smaller ships outweighs the cost to make a change. “I think the realization was we are not going to be a market for those super cruise ships. We never have been, we never will be, and that's okay. I think there's plenty of opportunities for mid-size ships,” says Buckhorn. Carnival just announced a new ship, Miracle, that will call the port home year-round starting in 2018. This year, the number of cruise passengers at Port Tampa Bay sank 2 percent, from 888,343 last year to 867,114. There’s also a concern that the cruise lines will continue to emphasize their bigger ships. “I think we're going to be competitive for at least another decade, and then we will have to revisit it, and think what our future is, and what the market is, and what Tampa looks like at that point," says Buckhorn. "It could be at some point the real estate value is more than the cruise industry." Buckhorn believes putting a new terminal on the other side of the bridge at Fort De Soto is a bad call for the environmentally-sensitive area and for fishing. FDOT says another feasibility study would have to be done before moving ahead with any option. 04.04.16: Port Tampa Bay Prepares for the New Canal Era. 04.04.16, maritime-executive.com, As the prospect of increasing volume from the New Panama Canal approaches, the Port of Tampa Bay is upgrading its container facilities to join the increasing number of U.S. East Coast ports capable of handling larger vessels. Today it took delivery of two modern gantry cranes in anticiation of the new, larger ships that will begin passing through the expanded Canal later this year. The cranes, purchased for $24 million from Chinese firm ZPMC, can accommodate stack heights to 130 feet and can reach out to 174 feet, enough to handle 9,000 TEU container ships - almost twice the size of the current maximum capacity at the port. “The arrival of these new container cranes marks an important milestone for Port Tampa Bay, enhancing our ability to better serve our large and growing market,”said Paul Anderson, port president and CEO. The port says that its regional market, the Tampa Bay-Orlando corridor, is Florida's fastest growing region and is home to the state's largest concentration of distribution centers. However, it may have to overcome obstacles above and below the water to gain the business of the largest vessels transiting the new canal. Port Tampa Bay's container terminal has a draft restriction of 43 feet, according to the port's information sheet, and the Sunshine Skyway Bridge restricts visiting vessels to those with an air draft of under 180 feet. The largest of the New Panamax ships are designed to dimensions of up to 1,200 feet long and 161 feet wide, with a draft of 50 feet and an air draft of 190 feet; they can carry up to 13,000 TEU. Competitor PortMiami claims that it is the only "major logistics hub" south of Virginia capable of handing the largest fully laden New Panamax vessels, having recently completed a $1 billion dredging project to increase its container terminals' maximum draft to 52 feet. The port's maximum air draft is 210 feet. Just north of Miami, Port Canaveral is also investing in container capacity, with a dredging project to accommodate vessels to 40 feet of draft, and a new container terminal, its first, which began operation with two refurbished gantry cranes just last year. 04.19.16, tbo.com, Mega cranes go under Skyway bridge, Port Tampa Bay has released video of its two new gantry cranes coming under the Skyway headed to the port. The new $24 million mega cranes can reach further across wider, newer ship decks to retrieve containers, which will broaden the port’s customer base. “What we are doing is for the last two years, building our video library. Part of our brand development efforts include a lot of still photography and video,” said Karl Strauch, vice president of brand development and strategic alliances for Port Tampa Bay. The port will use video footage and still photography to reach out to potential new customers, promoting everything the port has to offer from its ships to berths, cargo and real estate, Strauch said. 01.10.16: Port Tampa Bay looks to keep cruising despite restrictions on mega ships. TAMPA — Megaships that can carry more passengers than the populations of many small towns might be all the rage for some Florida ports, but Port Tampa Bay is wagering that it can keep its cruise business robust without the floating cities. Those giant ships can’t reach the Tampa port due to the height of the Sunshine Skyway bridge; besides, port officials say, not everyone wants to vacation with 5,000 people in close quarters. And if the Cuba market opens up, he said, Port Tampa Bay could increase its cruise business with the moderate-sized ships already using local berths. The cruise ships that can slip under the Sunshine Skyway are enough to keep the cruise industry in Tampa thriving for the next 15 to 20 years, he said, because more cruise lines are updating and refurbishing ships rather than retiring them. Also, plans for a bustling Channel District filled with trendy restaurants, shops, a park and a marina will add to Tampa’s allure and keep the ships coming, Alfonso said. Still, this may not be a forever situation, he said. Port Tampa Bay has not completely ruled out developing a plan that would allow for the megaships in the future. It’s just not ready to move forward on a major feasibility study. In 2015, the moderately-sized cruise ships boarded 867,114 passengers at Port Tampa Bay, and Alfonso said he has reason to believe that number will grow over the next three to five years. The ships boarding passengers in Tampa range in size from the 719-foot Holland America Veendam (1,350-passenger capacity) to the 965-foot Norwegian Cruise Line’s Norwegian Star (2,348-passenger capacity). The German 2,194-passenger AIDAmar uses Tampa as a port of call when it travels toward the western Caribbean. To welcome the new megaships to Tampa would require a huge expense. According to a prefeasibility study released in 2014 by the Florida Department of Transportation’s Seaport Office, it could cost anywhere from $1 billion to $2 billion to modify or replace the Sunshine Skyway to allow taller ships through to Port Tampa Bay, or more than $600,000 to build a cruise ship terminal west of the bridge to accommodate the larger ships. The Tampa Port Authority board agreed that year to send a letter to the DOT asking it to proceed with a feasibility study, but apparently that letter was never sent. State Seaport Manager Robert Emerson said no such study is being conducted at this time. Already, though, the port has moved ahead, unveiling plans last year for the Channel District, between The Florida Aquarium and the historic banana docks along Channelside Drive. Port consultant Luis Ajamil said in September that the master plan for the Channel District would take about a year to complete. In its earliest form, the district would include four districts on 45 acres — the marina district, the park district, the central waterfront and the cruise district. It would take an estimated $1.5 billion in private investment and require about $200 million in infrastructure improvements that the port and the city of Tampa’s Community Reinvestment Act funds would cover. The Channel District could be a big draw for those cruising from or into Port Tampa Bay, Alfonso said. Meanwhile, PortMiami, Port Everglades and Port Canaveral will see big shifts coming from Royal Caribbean, Norwegian and Carnival Cruise Line this year. The biggest change, literally, will be the arrival of the new record-holder for world’s largest cruise ship, Royal Caribbean’s 5,479-passenger Harmony of the Seas, which is set to debut in Europe this spring and then make its way to Fort Lauderdale by November. To make room for Harmony, Royal Caribbean is sending the 5,400-passenger Oasis of the Seas to Port Canaveral starting in November. Port Canaveral is also benefiting from the giant ship shuffle from Norwegian Cruise Line, according to the Orlando Sentinel. Since PortMiami is now home to both Norwegian Getaway and the new Norwegian Escape, what used to be Norwegian’s largest cruise ship and used to call Miami home, the 4,100-passenger Norwegian Epic, will also make its way to Port Canaveral. The line, which just last fall returned to Port Canaveral after a three-year absence, will bring Epic the same month as Oasis of the Seas. Norwegian is also bringing a new cruise to Port Tampa Bay with the Norwegian Jade. It will offer a new port of call at Harvest Caye in Belize, which boasts a rainforest, Mayan ruins and wildlife watching. Norwegian will also offer a new 10- to 11-day cruise to the eastern Caribbean from Tampa beginning in the fall, Port Tampa Bay’s Alfonso said. Carnival Cruise Line will bring one of its largest ships to Port Canaveral when the 3,690-passenger Carnival Magic arrives in April, the Orlando Sentinel reported. Magic is the second of the line’s three Dream-class ships, built in 2011. It’s relocating from Galveston, Texas, which will get the line’s latest Dream-class ship, Carnival Breeze, currently sailing out of PortMiami. Not all changes are on a grand scale at the ports. Port Everglades just welcomed the 2,260-passenger Costa Deliziosa, which brings the Italian line back to the port after a four-year hiatus. It will sail out of South Florida until March. Older, smaller vessels, which often make way for newer builds, have proved profitable for lines such as Royal Caribbean, which also is bringing Majesty of the Seas to Port Canaveral beginning in May. At one point, Royal Caribbean had planned on sending the ship, which was built in 1992, to its subsidiary, Pullmantur, but it rethought its strategy, and the 2,350-passenger ship will take over 3- and 4-night sailings for the Tampa-bound Rhapsody of the Seas. Also coming to South Florida in 2016 will be what’s billed as the most luxurious cruise ship ever built. Regent Seven Seas Explorer will make its way to Miami by December. 08.13.15: Port Tampa Bay unveils $1.7 billion plan to develop 45 acres in Channel District. 08.13.15, tampabay.com, TAMPA — The land that Port Tampa Bay owns near downtown is now 45 acres of sun-beaten asphalt. 08.25.14: Might a tunnel bring big cruise ships to Port Manatee? PORT MANATEE -- A proponent of expanding South Florida's cruise ship trade says digging deep is the best way to give giant ships unable to fit under the Sunshine Skyway Bridge enough air and water space to bring passengers to Port Manatee and Tampa Bay's other ports. He's not talking about a deeper channel for ships to navigate. Instead of sailing boats under the traffic span, Neil Consentino wants to route cars and trucks through a tunnel. Cosentino has already pitched his tunnel ideal to the Tampa Port Authority. Speaking to the Manatee County Port Authority Board last week, the perennial candidate for Hillsborough County commissioner said routing Interstate 275 traffic underwater into a tunnel for part of the Tampa Bay crossing is the best alternative to state-authored proposals to either build a new port seaward of the Skyway bridge or tear the bridge down and build a taller one. His design templates come from the 20-mile Chesapeake Bay Bridge-Tunnel and the Baltimore Harbor Tunnel, which give ships room to sail while providing necessary vehicle traffic links. The idea is a departure from the new harbor and new bridge plans offered by the Florida Department of Transportation. FDOT proposed the ideas in a July 8 report chronicling Tampa Bay's unsuitability to host a new generation of super-sized cruise ships given the Skyway's height limitation. Many new cruise ships exceed the maximum 180 feet of air clearance under the bridge, thus cannot sail to Port Tampa Bay or Port Manatee. Cosentino said building a tunnel to replace the eastern portion of the bridge would give ships the unlimited air space and deep draft clearance needed to reach either port. Emphasizing he is not an engineer, Cosentino gave no cost estimate for the project. FDOT estimates the cost of demolishing and replacing the Skyway bridge at $2 billion. Building a new cruise port would cost slightly less than $650 million, according to the FDOT. Cosentino said the tunnel could be seamlessly connected to the Skyway bridge when finished, thus avoiding the interruption in service replacing the bridge would cause. It would also keep cruise revenues going to port facilities already built on the bay. The actual construction, he said, would involve dredging a shipping channel, then either excavating a groove in which tunnel sections would be assembled or drilling the tunnel through sea floor rock. Authority Chairwoman Carol Whitmore said she appreciated the "out-of-the-box" thinking on a problem the state and its port partners need to solve. "We do realize if we don't do something on the west coast of Florida, the state will lose billions of dollars in the future," she said. Doing nothing is one option put forth by FDOT. The consequences include losing as many as 35 million cruise passengers in the long term, according to the report. Port authority member Vanessa Baugh was particularly intrigued with Cosentino's proposition because she grew up in the Chesapeake Bay area and traveled the bridge-tunnel after it was built in 1963. She said nearby Port Norfolk benefited greatly from the direct connection across the mouth of the bay. Whitmore said solving the giant cruise ship issue may be the first project Port Manatee tackles as a member of a new regional leadership structure being coordinated between all three Tampa Bay ports. Port Manatee has served as a cruise ship destination in the past and still retains a cruise terminal on its property. 08.17.14: editorial - Don’t underestimate value of Tampa Bay in cruise port discussion. 08.17.14, tbo.com, As state and local officials review the possibility of dredging up a massive cruise ship port near the mouth of Tampa Bay, they should consider a study on the economic value of Tampa Bay recently conducted by the Tampa Bay Regional Planning Council. It found that a clean Tampa Bay figured in at least 13 percent — or $22 billion — of the total economic activity of the six-county Tampa Bay region. Yet a healthy Tampa Bay has seemed a secondary concern as Port Tampa Bay and the Florida Department of Transportation look for ways to accommodate a cruise ship industry now building massive ships that won’t fit under the Sunshine Skyway bridge. 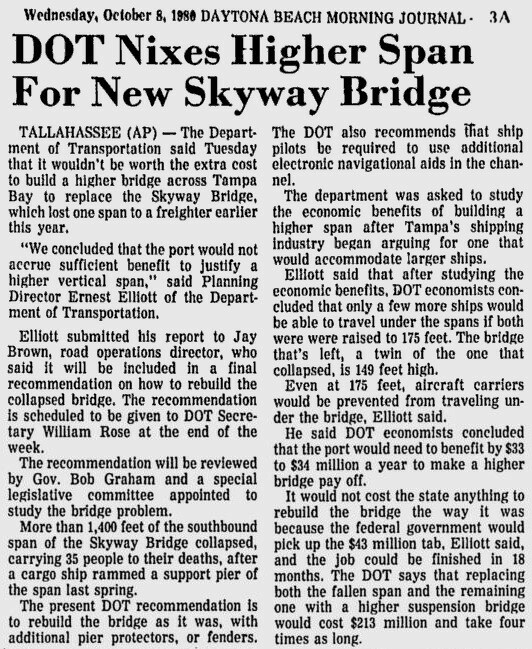 A DOT pre-feasibility study estimated the cheapest way to serve the big ships would be to build a port west of the Skyway, which it estimated would cost about $650 million, compared with about $2 billion to replace the bridge. Tampa’s cruise ship industry accounts for about 2,000 jobs, has an annual income of some $90 million and generates about $379 million in economic activity. Officials plan to explore the options, which is appropriate. The decision on what course of action to take, if any, will be a long process. Still, that officials would seriously consider dredging up a port near the Skyway is alarming. We find the pre-feasibility findings on the option highly suspect. The DOT study estimates on the cost of developing a 50-acre facility give scant attention to the costly environmental havoc such a project would surely cause — destroying seagrasses and marine life habitat, disrupting tidal flow and deteriorating water quality. State officials breezily say any environmental harm would be “mitigated” by performing restoration projects elsewhere in the bay. But we doubt it would be possible to undo the damage of developing on submerged land a facility that would contain, as the pre-feasibility study says, four berths, with each terminal needing at least 100,000 square feet for security, check-in, baggage, customs and border facilities and such. Parking for 9,000 spaces, with the potential for growth, also would be needed. The massive development also would require the dredging of new channels. To so savagely alter Tampa Bay would almost surely cause enduring harm, and not just to the estuary and possibly the nearby Pinellas beaches, but to the local business climate, as well. The Tampa Bay Regional Planning Council report found the bay is a powerful economic driver. To calculate the value of the bay, analysts reviewed real estate, restaurants, employment, lodging and food service statistics. They also surveyed professionals working with industries affiliated with the bay. As the report points out, determining the economic impact of shipping, fishing or boating is fairly straightforward. It is more difficult to evaluate how the bay figures in business and residential decisions. The study concluded the bay had an influence in 40 percent to 60 percent of business activities, and that a clean bay was an influence in 13 percent to 39 percent. The study also found Tampa Bay played a role in about 600,000 jobs in the region — every other one. A clean bay figured in about 300,000 jobs — or about one in every five. The study included jobs only in the 68 percent of the six-county region that actually are in the Tampa Bay watershed. It also addressed the bay’s impact on real estate values, hotel rates and such. Analysts even estimated that the filtering qualities of seagrasses, shoreline marshes and mangroves spares the region about $24 million in wastewater treatment that would otherwise be needed to reduce nutrient pollution. Of course, as the study concedes, placing a value on “ecosystem services” is not an exact science, and one can contest such calculations. But anyone who doubts that Tampa Bay is a major economic engine should consider what life would be like were we to the undo the progress that has been made in cleaning the once-polluted bay, which had lost nearly 80 percent of its seagrasses and nearly half of its mangrove forests. Now the bay is cleaner than it has been in decades. Seagrasses are returning to the once-barren bottom, and marine life has rebounded. Without a healthy Tampa Bay, the region’s economic prospects and quality of life would profoundly diminish. The bay’s welfare must be a priority in the cruise ship discussion. Who would have ever imagined almost 30 years ago when it first opened that the Sunshine Skyway expanse would come to be regarded by the cruise industry as something out of The Bridges of Madison County? To this day in certain (ahem) households one can find a spouse who is terrified at the prospect of driving over the massive Skyway, which is 180 feet above the entrance to Tampa Bay. That may seem tall to some. To the ever burgeoning cruise business it is a trifle of puniness, considering a new generation of cruise ships can reach a height of 236 feet. Even an arithmetic-challenged first-grader could figure this out. More than a million passengers depart from Port Tampa Bay on 239 voyages annually. The economic impact: An estimated $380 million supporting 2,000 tourism-related jobs. But because the Sunshine Skyway bridge has become the maritime equivalent of a pothole, all of that is at some risk of running aground. Even now, lesser cruise ship mortals barely squeeze under the Skyway. And there is an additional problem, because points in the bay's shipping channels are so relatively narrow that even if a mega cruise ship could cross under the Skyway: A) two mega ships could have problems passing each other and/or B) there isn't enough room to spin the ships around. Think of this as trying to stuff Charles Barkley into a petite wet suit. What this bodes for the future is perhaps a day will come when the only "cruise" ships navigating the bay will be low-profile dinner cruises. Is there a solution? There's always a solution if you're willing to write a big enough check — a very, very big check. One idea being bandied about would call for a newer, bigger and very much taller Sunshine Skyway bridge — thus adding more terror to the drive over it — to be built at an estimated price tag of $2 billion. What part of, good luck with that, does anyone not understand? Some would argue the more practical approach would be to simply build a new cruise facility to the west of the Skyway. The Tampa Port Authority already owns existing property that could conceivably accommodate a 100,000-square-foot terminal and a 9,000-space parking garage at a cost of about $700 million for the project. But nothing is ever simple. The new cruise port would require the cooperation of Pinellas County and there are a variety of environmental concerns over the protection of wetlands and manatees. And you just know if this thing begins to get any traction, there will inevitably rise up grumpy objections from St. Petersburg swells who complain a new cruise terminal will destroy the same spot where they used to go necking in 1953. There's another option. Do nothing. And hope the era of mega-mega ships the size of a Death Star will eventually fade away as a fad in favor of a new waterborne tourist mode of transportation to save the Port Tampa Bay: the cruise submarine. 07.20.14: Pinellas port study dredges up concerns. TIERRA VERDE — Aside from spending $1.5 billion to $2 billion to replace or drastically alter the Sunshine Skyway bridge, the only viable option for bringing bigger cruise ships to the Tampa Bay area in the coming years would be a new cruise terminal just beyond the bridge. Such a port, located in pristine waters near the deep-water channel that runs between Fort De Soto Park and Egmont Key, could accommodate the ships planned for the future, luxury liners with up to 5,000 passengers, ships too large for the Skyway’s 182-foot clearance. Just the concept of a dredged, 50-acre seaport in coastal waters prized for unspoiled natural beauty and sensitive aquatic ecosystems raises serious doubts for those concerned about protecting the health of the bay. St. Petersburg College oceanographer Heyward Mathews says a proposed full-blown feasibility study would just be a waste of money. “The idea that they could ever, ever get a permit — maybe they might could have 75 years ago, 50 years ago; probably not — but nowadays, it’s never going to happen,” Mathews said. Dredging a deep-water port in the shallow estuaries along Egmont Channel for these colossal cruise ships would stir up so much silt that the water quality along miles of beaches would be spoiled for decades, he said. “The beaches as far as Johns Pass, the water would look like dirty brown coffee for many years to come,” he said. The terminal, though, could secure the future of the local cruise industry based in Tampa, which provides 2,000 jobs and likely will serve 1 million passengers this year. Elected officials and tourism leaders have called for more study on how it could be built and whether a cost estimate of $647 million in a preliminary Florida Department of Transportation study is realistic. For Port Tampa Bay, which is struggling to find a way to sustain its second-tier cruise market operating out of Tampa’s Channel District, the concerns may be premature. The $150,000 early feasibility study released this month merely mentions building a cruise port on the seaward side of the Skyway. It offers few details on how it would be built. Such a facility would include four massive berths and a 100,000-square-foot terminal with a lobby, security check-in, baggage areas and customs office. A boutique hotel, restaurants, shops, a marina for megayachts and 9,000 parking spaces also would factor into the design. The Hillsborough County boundary line cuts through a swath of offshore land west of the bridge, but the new port facilities likely would end up in Pinellas. Port officials have been investigating the idea for at least two years but have said little about specific sites, how it would be connected to the bridge or nearby barrier islands or the possible environmental fallout. “It’s a very long process. We’re at the infancy stage of that long and drawn out process,” port spokesman Andy Fobes said. An in-depth feasibility study requested by the Tampa Port Authority board would address these kinds of specifics. Some elected officials appear open at to least investigating the options in the preliminary study. “It’s important we begin this dialogue now and explore all options to ensure the Port of Tampa is positioned to maximize future cruise business opportunities,” U.S. Rep. David Jolly, R-Indian Shores, said in a statement after the study was released. A serious investigation of environmental impacts would be needed before even considering the idea, said Pinellas County Commissioner John Morroni, who represents barrier island communities close to the Skyway. “The last thing we want to do is put our waters in any kind of jeopardy from the cruise ships,” said Morroni, a former chairman of the county’s Tourist Development Council. Though the majority of cruisers who disembark in the Channel District don’t spend much time or money in Tampa, a port closer to the beach could entice tourists to spend a few extra nights in the area, said Tim Bogott, CEO of TradeWinds Island Resorts on St. Pete Beach. Many in the local tourism business will be following future studies carefully and scrutinizing them to ensure that any proposed port wouldn’t burden taxpayers or damage the industry’s most precious economic resource. “We have beautiful natural resources, beautiful beaches here. Fort De Soto has been rated among the best in the world,” said Robin Sollie, CEO of the Tampa Bay Beaches Chamber of Commerce. That natural resource has begun to fully recover from years of dredging activity across Tampa Bay for the sake of residential and commercial development. Southwest Pinellas is home to the bay’s cleanest water, nourishing thousands of acres of seagrass beds that have returned slowly in the past decade as more sunlight reaches the seafloor. Much of the area around the southern barrier islands is an aquatic preserve, and there’s a national wildlife refuge in the area that supports growing populations of fish and birds, said Peter Clark, president of the Tampa Bay Watch environmental group, which is headquartered just outside Fort De Soto Park in Tierra Verde. “The area they’re talking about is one of our most critical productive areas in all of Tampa Bay,” said Clark, who was surveyed as part of the recent FDOT study. Any prospective project would have to prove to state and federal agencies that environmental damage would be offset by greater improvements to water quality elsewhere in the bay. That would be a tough sell for such a large-scale development, which would almost certainly involve dredging up major sections of this fragile environment to expand or create an artificial island for a deep-water port. In recent decades, the U.S. Army Corps of Engineers hasn’t been inclined to approve many of these dredging projects, Mathews said. Smaller proposals in Clearwater Harbor, at Albert Whitted Airport in St. Petersburg and a big residential development on the back side of Honeymoon Island in Dunedin all ended up being scrapped after strong community opposition, Mathews said. Past efforts to create man-made channels continue to cause serious beach erosion up and down the coast. Fort De Soto’s famed North Beach — called the best in America by the coastal expert “Dr. Beach” — is eroding quickly from natural causes, but dredging activity, even several miles away, could speed up that process as tidal flows between the bay and the Gulf of Mexico are altered. “The environmental impact of something like that is so enormous it’s not going to take a marine scientist to realize right off the bat this is not compatible with lower Pinellas County’s waters,” Mathews said. Bay area political and business leaders aren’t likely to dismiss the idea that quickly, though, with the very real prospect of losing an industry that one day could generate nearly $1 billion in economic activity, according to the FDOT report. Based on the size of ships being built by major cruise companies, 90 percent of them won’t be able pass beneath the Skyway a decade from now, port officials have said. But the benefits of sustaining the area’s modest cruise business, which would be a fraction of the activity at Florida’s bigger ports on the Atlantic Coast, may not outweigh the costs of keeping it here. In light of all the environmental pitfalls, Tampa Mayor Bob Buckhorn isn’t sure the forthcoming feasibility study will show that big cruise ships have a strong future here. “What I hope out of this study is we’ll determine, even if we made all these improvements, even if we built a new terminal, whether or not Tampa Bay would be a destination for the mega cruise lines anyway,” he said. 07.18.14: Cruising for ideas on Tampa Bay's costly mega ship problem. Tampa Bay residents have long been generous in offering helpful advice, be it to football coaches, fellow motorists or visiting tourists. So it's no surprise that after a state study revealed that the local cruise ship industry is endangered because mega ships will not fit under the Sunshine Skyway bridge, suggestions from local residents poured in. Tampa Bay Times readers offered solutions they believe might be more feasible (cheaper) than the two expensive solutions offered in the state study. The Times did not vet these ideas but is simply passing them along to keep the dialogue going. The report said raising or replacing the Skyway could cost up to $2 billion and building a new cruise ship port on an artificial island on the Pinellas side of the bay could cost about $700 million. Then the mega ships would not have to go under the bridge at all. Ferries and islands: A few readers suggested that high-speed ferries could shuttle passengers back and forth from the cruise terminals in downtown Tampa to mega ships moored on the seaward side of the Skyway. "I will miss not sailing under the Skyway while having our dinner," a reader wrote via email. "But such is life." But how would the cruise ships be refueled and resupplied? Perhaps by creating a place for those ships to dock, so they can take on supplies and passengers. One reader suggested building a "small concrete island" for ships. Another said a "floating" island could accommodate the ships as well as a hotel, restaurants and smaller vessels. But it wouldn't have to be big enough to handle parking. Those ideas are similar to the Pinellas cruise port suggested in the state study. It would be built on an artificial island created from dredging a channel toward the Pinellas coast from the main shipping channel that passes under the Skyway. Dry dock: One reader suggested using a floating dry dock to help lower mega cruise ships so they could sail below the existing Skyway. The mega ship would float inside the dock, which tugboats would push under the bridge into the bay. But the bridge isn't the only infrastructure hampering the cruise ship industry. Tampa Bay's shipping channels might have the depth to handle bigger ships, but they might not have the width. The turning basin doesn't have enough room for mega ships to be turned around. And downtown Tampa's cruise terminals can't handle mega ships, either. Tunnel: The Baltimore Harbor Tunnel is a 1.45-mile, four-lane tunnel that allows traffic to pass beneath the entrance to Baltimore's harbor. The Baltimore tunnel allows traffic on Interstate 895 to flow under the water while ships pass above, just like the nearby Fort McHenry Tunnel, which serves Interstate 95. Local activist Neil Cosentino pitched the idea to the Tampa Port Authority on Tuesday. But he thinks the tunnel should be built on the Manatee side of the bay. He also said the port should combine with the Manatee County Port Authority to create a global port that can handle not just mega cruise ships, but the new generation of gigantic "new Panamax" ships that will pass through the expanded Panama Canal. Those are very ambitious plans, however. Then there's the political element: Port Manatee has accused the Port of Tampa of trying to execute a hostile takeover. The two ports also compete against each other for certain cargos, and there was some recent jostling over pineapples. Locks: The Panama Canal uses a series of locks to raise and lower ships as they travel from the Atlantic to the Pacific. So one reader suggested: Why not build locks to help mega ships pass below the bridge and enter Tampa Bay? The reader admitted that might be more expensive than replacing the Skyway. He wanted to run it by experts. "Just an idea from an armchair dreamer," the reader wrote. Do nothing: One reader, an oceanographer, wrote that trying to build a cruise port off the southwest corner of St. Petersburg would be an expensive and inadvisable folly. Not only would it be a permitting nightmare — involving the U.S. Army Corps of Engineers, the U.S. Fish and Wildlife Service, and the Florida Department of Environmental Protection — but the reader said such a project would also endanger Pinellas' world-class beaches and some of the most environmentally sensitive and pristine undersea areas in the bay. "I thought I had heard all the harebrained ideas that (they) could possibly come up (with)," the reader wrote. "I was wrong." Port Tampa Bay is the nation’s eighth-largest cruise port, with close to $380 million in economic activity and 854,000 passengers visiting in fiscal year 2013. The Florida Department of Transportation has released a pre-feasibility study regarding the cruise industry in Tampa Bay. In essence, it said that in the next 10 years the majority of ships from all the major cruise lines will not be able to sail under the Sunshine Skyway Bridge due to height restrictions. First, we applaud the department and Port Tampa Bay for having the vision to look ahead and address an issue before it becomes a problem and it is too late to react. Here are some facts that we know about cruising. In 2012, cruising generated more than $42 billion in gross revenue and created more than 356,000 jobs nationally. Florida represented one-sixth of the national economic impact, $7 billion. Port Tampa Bay is the nation's eighth-largest cruise port, with close to $380 million in economic activity and 854,000 passengers visiting in fiscal year 2013. It home-ports four cruise lines (Carnival, Holland America, Royal Caribbean and Norwegian) with five ships. And they continue to grow. The port will be adding a second Royal Caribbean ship, the Vision of the Seas, this fall. Royal Caribbean is even adding new itineraries, which will include nine- and 10-day eastern and southern Caribbean cruises in 2015 and 2016. Port Tampa Bay will also see port of call visits from new customer and German cruise line Aida Cruises starting in late 2014. The cruise industry is an important part of Port Tampa Bay's portfolio of business. The port's various lines of business continue to make it the largest economic engine in the region and help our economic development agencies attract new business. Port Tampa Bay, with its $15.1 billion in annual economic activity and 80,000 direct, indirect and related jobs, is a key component of our region's future growth opportunities. Each year, Port Tampa Bay ranks among the highest in customer satisfaction with its cruise passengers, and when you couple that with our world-renowned and award-winning airport, you get a winning combination that few cities or regions possess. The port, cruise industry and travel industry leaders expect continued growth in the cruise business for Port Tampa Bay in the near term, approaching (and possibly surpassing) a million passengers each year. However, based on the Department of Transportation study, if the region does not take action in the future, the lost economic opportunity is close to $1 billion of economic impact, and nearly 5,000 direct, indirect and related jobs annually. That is a huge opportunity which might literally sail to states like Texas and Louisiana if we do not do anything. With that, we, along with our regional and community partners fully endorse taking the next step, which would be a more in-depth study to look at all the options related to address the air draft situation so that the port can continue being a top 10 cruise destination. The second phase of the study will address the impacts, economic and environmental, for the various solutions, so that the community can have an educated discussion while looking toward the future of the region. Joe Lopano, CEO of Tampa International Airport; Stuart Rogel, CEO of Tampa Bay Partnership; Bob Rohrlack, president and CEO of the Greater Tampa Chamber of Commerce; and Bob Sharpe, chairman of the board (retired) of the Auto Club Group, agree on this approach. We are excited as this region continues to be a leader for our great state in growth and opportunities. Port Tampa Bay plays a very important role for that growth, and we look forward to working with them to make our region the premier place to live, work and play for years to come. Santiago Corrada is president and CEO of Visit Tampa Bay. Rick Homans is president and CEO of the Hillsborough County Economic Development Council. They wrote this exclusively for the Tampa Bay Times. 07.11.14: Tampa's mega cruise ship options limited, expensive, risky. To save the local cruise ship industry, Tampa Bay has to choose between two of the biggest and most expensive public infrastructure projects in its history. One proposal is to spend $2 billion to replace or raise the Sunshine Skyway bridge so that it would be tall enough to allow new mega-sized cruise ships to pass underneath it. Those ships are the future of the cruise industry, but they cannot sail under the current bridge. The other option is to build a $700 million cruise ship port on the Pinellas County side of the Skyway so that the ships would not have to go under the bridge at all. "Obviously, I don't think replacing the bridge is a wise decision," said Pinellas County Commission Chairwoman Karen Seel. Neither does St. Petersburg Mayor Rick Kriseman. "Mayor Kriseman thinks the only viable option would be a terminal on the west side of the Skyway," communications director Benjamin Kirby wrote in an email. The state study released Tuesday revealed scant details about either option, especially about the Pinellas cruise port. Where would it be built and how? What about the environmental impact on Pinellas' world-famous beaches? The public and the politicians will need to know all that before deciding what to do next. But those answers will have to wait for the next study. "Of course I'm concerned about our beaches and I'm concerned about our environment," Seel said. "But it's too preliminary to make a decision about what's feasible and what's not." But Richard Wainio, former executive director of the Tampa Port Authority, has some insight into those issues. He took over the Port Authority in 2005 and spent his seven years there wrestling with the cruise ship issue. "I knew it was going to be a problem even before I got here," said Wainio, who left the Port Authority in 2012. A few years ago, Wainio said he asked engineers to assess if, and where, a Pinellas cruise terminal could be built west of the Skyway bridge. The answer: It can, and the best site would be in the waters off the southwest corner of St. Petersburg, around the approach to the Skyway. The Tampa Port Authority controls all the submerged lands in Tampa Bay and around the shipping channel, so a Hillsborough County agency would take the lead in building such a facility and running it off the Pinellas coast. The port, which already generates revenue from cruise ship passengers, would also profit from a new cruise port. The Port Authority would build the terminal on an artificial island created by the dredging that would be needed to create a channel for the ships, Wainio said. The new channel would be like a left-hand turn lane flowing from the main Tampa Bay shipping channel that runs under the center of the Skyway. That artificial island would be connected to the mainland by a causeway bridge, an idea that Wainio said the Florida Department of Transportation studied and deemed plausible. But Wainio cautioned that the engineering work determined only that such a cruise port could be built on the Pinellas side of the bay — not that it's a good idea to build one. "For anybody to say this is a good idea at this point is jumping way ahead," he said. "But if you're going to do something, I think that appears to be the best option." Kriseman's spokesman said the mayor supports the concept but wants to see a "more innovative, less environmentally impactful" option, such as the offshore cruise port site Wainio studied years ago. Other environmental concerns include the spoil islands, bird sanctuaries and sea grass beds located near the proposed site, as well as the effects passing cruise ships could have on beach erosion. The site is also in lower Tampa Bay, known for having the best water quality in the bay. "It's all very hard to evaluate at this point," said Maya Burke, senior environmental planner for the Tampa Bay Regional Planning Council. Wainio said many studies will need to be done before local leaders can decide whether building a new cruise port is a good idea. And, he added, such a project would have to be a regional undertaking. It would take extraordinary cooperation between Hillsborough and Pinellas counties. The facility might be owned and run by a Tampa agency, but it would need the support of St. Petersburg and Pinellas. "You need to create a vision," Wainio said, "and not just for Tampa. It's got to be for Tampa Bay, for Pinellas and Hillsborough." Another reason Wainio favors the proposed Pinellas cruise port is that the $2 billion estimate to build a new Skyway wouldn't actually solve the "mega ship" problem on its own. Even with a new bridge, Wainio said the existing cruise ship infrastructure and channels in Tampa Bay could not accommodate the mega vessels. The shipping channels might be deep enough for such ships, but Wainio fears they might not be wide enough. However, the Sparkman Channel turning basin near downtown Tampa's existing cruise ship terminals is definitely too small for tugboats to swing the mega ships around. "The bridge is only a piece of the issue," Wainio said. "We don't have cruise terminals, we don't have channels that can accommodate them." The Port Authority's cruise terminals are also too small for mega vessels. They can handle only half of the more than 5,000 passengers that the bigger ships can hold. "Most of your port infrastructure has not kept pace with the growth in vessel size and dimensions," said Allen Thompson, executive director of the Tampa Bay Pilots Association. In fact, the state study said the 180-foot limit of the Skyway down to the waterline has already had a detrimental effect on the Tampa Bay cruise market: "The air draft impediment has already cost the region cruise vessel deployments," the report said. Wainio thinks a business case could be made for building a Pinellas cruise port. The Tampa cruise market is a "drive-in" market. According to the port, about 60 percent of its passengers are within driving distance. That means those tourists are not spending a lot of time or money in Tampa. But in Pinellas, with the beaches nearby, those tourists might stay an extra day or two. Tourists who take cruises out of the state's biggest cruise markets in Miami and Fort Lauderdale spend extra time on land. "If you build a terminal like that and you start to serve those mega ships," Wainio said, "the nature of the business changes dramatically." But he cautioned that such a facility should not be built unless cruise lines sign contracts committing mega cruise ships to an offshore Pinellas terminal. "Whether it's a container terminal or a passenger terminal, I don't believe you build it and they will come," he said. "It's too expensive, too risky, too much competition. I think you absolutely have to have some kind of buy-in or commitment." The state study included a third option: do nothing. Instead of spending up to $1 billion (maybe $2 billion), the bay area could spend nothing and hope for the best. The Tampa Bay cruise market could survive as a niche market served by smaller, older ships. But that's assuming enough of those ships avoid the scrap heap in the coming decades and mega ships don't completely take over the market. But the older ships "most likely, they will disappear," said Raul Alfonso, chief commercial officer of the Port Authority. That would certainly hurt the port. In the past fiscal year, 22 percent of its revenue came from cruise passengers. That was $9.5 million out of $44.1 million in revenue. And the port expects to handle 1.1 million passengers this year, which would be a new record. The state report said the local economy would also take a hit. The local cruise business generated about $380 million in annual economic activity for the bay area in 2012 and supports about 2,000 jobs. The state study projects that, if the cruise business continued to grow, Tampa Bay could handle 3 million passengers by 2043. The industry could support more than 5,000 jobs by then. But that's why leaders need to see more studies, Tampa Mayor Bob Buckhorn said, to see whether the massive investment is worth that return. "Then it becomes a fairly pragmatic decision," he said. "How much are you going to invest versus how much would the return be? "We'll make those decisions, but it's important that we have the data and numbers in front of us." 07.10.14: opinion - Making way for giant ships would require major investment. A. Raising the deck of the Skyway, a strategy that would pose risks to the structure and require multi-year closures of the bridge. Estimated costs range between $1.5 billion and $2 billion. B. Building a new bridge, with a clearance higher than the Sunshine Skyway's, between Pinellas and Manatee counties. Estimated cost: $2 billion. The existing, iconic bridge -- completed in 1987 -- would have to be demolished. C. Creating a new cruise ship terminal and parking garage to handle 9,000 cars, seaward of the Skyway, on land owned by the Tampa Port Authority. That property is Pinellas County -- in the vicinity of world-class beaches, dense bayfront development and environmentally sensitive lands. Estimated cost: Nearly $700 million. These options were provided by consultants, hired by the Florida Department of Transportation, who recently completed a Tampa Bay Cruise Pre-Feasibility Study. The study analyzed the costs and benefits of hosting a new generation of mega cruise ships. Those vessels will be substantially taller than the ships that now ply the Gulf of Mexico and Caribbean Sea. They would also require substantial dredging of channels, which is expensive and has deleterious impacts on the environment. The preliminary analysis puts a positive spin on the value of the cruise industry. But, no matter the benefits, in this case Option A stands for "Ain't gonna happen." The public -- especially residents of Manatee and Pinellas, where the bridge makes landfall -- would revolt over the prospect of long-term shutdowns of the Skyway, diversion of traffic and multibillion-dollar costs. Option B is unappealing as well. The Skyway has at least 30 years remaining in its life span, according to the DOT, and legions of taxpayers would strongly challenge the demolition of an enormous asset and the expenditure of $2 billion more for a replacement. Furthermore, although cruise operations contribute to 22 percent of the Tampa Port Authority's revenue and generate taxes for state government, there are few direct benefits to Pinellas and Manatee counties. Option C may be the least costly alternative that imposes the fewest hardships on the public, but it would be an immense project, one likely to encounter strong political opposition -- especially in Pinellas. The strategic plan for Port Manatee does not focus on the cruise-ship industry and there has been little, if any, discussion about changing the county-owned port's strategy. 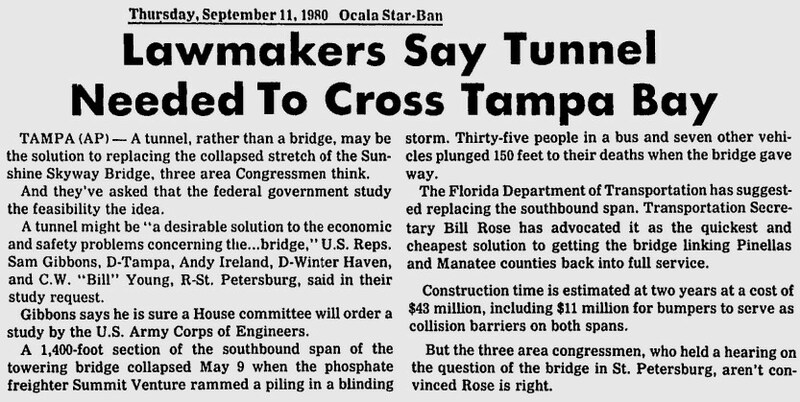 In short, despite the economic benefits that would accrue to the state if the larger ships were accommodated, there would be few compelling reasons for residents of Manatee and counties to the south to support construction of a new Skyway or raising the clearance of the existing bridge. The study concluded that, if the larger ships that will dominate the market don't dock in Tampa, they are unlikely to use other Florida ports that have their own constraints. But, even if Tampa Bay could accommodate the mega ships, the region is likely to remain a "second-tier" -- and less appealing -- market for the industry. The consultants did offer a fourth alternative -- Option D, we'll call it, for "Do nothing." This option has some appeal because, based on the early analysis, the other ideas are hugely expensive, potentially fraught with public opposition and subject to complex approval and permitting processes. It's vital for state, regional and local transportation leaders to look to the future -- not only to gauge the status of particular industries that need ports, but to ensure that bridges and channels can safely handle vessels that are crucial to commerce. For instance, cargo ships will soon be wider and have deeper drafts. Will those vessels be able to safely transit to and from Port Manatee and Port of Tampa without big investments in infrastructure and dredging? • Any efforts to accommodate mega ships would have to include substantial financial contributions from the industry. • The projects and cruise ships would have to provide returns on public investments so high that they would blow the benefits of other expenditures out of the water. Carnival Cruise Lines' MS Sensation passes under the Sunshine Skyway Bridge in 1998 en route to the Port of Tampa, where it was to begin weekly western Caribbean cruises. The ship's vertical clearance was so high, Carnival officials had to cut off five feet of the funnel mast to accommodate passage under the Skyway bridge that connects Pinellas and Manatee counties. 07.08.14: Could cruise industry float out of Tampa Bay? 07.08.14, wtsp.com, Jennifer Titus, WTSP, New, bigger cruise ships don't fit under Sunshine Skyway. The Port is now looking at options. Tampa, Florida -- Could the thriving cruise industry float right out of Tampa Bay? Yes, according to a new study that shows the Sunshine Skyway is too short for new and improved cruise ships. Basically, these taller cruise ships coming out just can't fit. So, after a pre-feasibility study from the Florida Department of Transportation, a few options have been announced. If nothing is done, Port Tampa Bay says the region will lose out on over 2.5 million passengers, resulting in an estimated annual economic hit of close to $1 billion and up to 5,000 cruise-related jobs. The FDOT study goes even further saying the Tampa Bay region would miss out on between 33 to 35 million cruise passengers through 2043. A possible solution is to build a new port west of the Skyway Bridge. The study says that it would need to be on at least 44 acres, house 4 ships, and have a 9,000 parking spaces.Total cost would be between $632 and $647-million dollars. Another option -- building a new Skyway. The total cost of construction and demolition would be approximately $2 billion dollars and the construction period for a new bridge would be 4 years. The current bridge would remain open during construction and demolition of the old bridge would take 2 years. Finally, the last option, raising the current Skyway bridge. The total cost would be $1.5 billion dollars, and the bridge would need to be closed for approximately 2 years. with total construction time lasting 3 years. "There are certain itineraries now that could not come here so our passengers can not plan accordingly with Tampa Bay in mind. If that's affecting us already a little bit, in the future it's going to be worse and worse," says Raul Alfonso, Executive Vice President of Tampa Bay. So how long until a decision is made? Alfonso says months, maybe years and he hopes for the region's input in a final decision. He says if nothing is done and we lose the chance of ships coming here, the ships could go to other states along the gulf, which could have a major economic impact on Florida. 07.08.14: Study addresses how to accommodate cruise ships too large to fit under the Skyway. 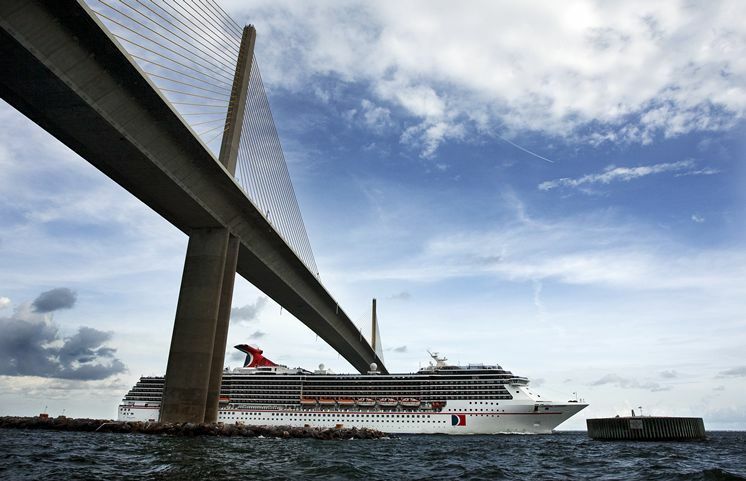 MANATEE -- The final version of a study addressing what to do when cruise ships are too large to sail beneath the Sunshine Skyway Bridge does not make any specific recommendations, but is an attempt to "bring the best data together," state officials said Tuesday. "The study was commissioned to determine how the region can both maintain its current cruise business while at the same time allow for significant growth from the new 'mega' cruise ship market, and to identify potential courses of action," said a news release from the Florida Department of Transportation accompanying the study. "The resulting study provides a knowledge-based foundation in the determination of future direction of the cruise industry in the Tampa Bay region," it said. The study notes that low bridge clearance of the Sunshine Skyway Bridge prevents larger vessels from using the Tampa Bay terminals and support infrastructure. The air draft of most new cruise ships now exceeds the bridge's height limit, at 180 feet, it said. Three ports operate in Tampa Bay, including those in Manatee, St. Petersburg and Tampa, although Tampa's is the only one now hosting cruise ships. HHowever, Port Manatee is looking at opportunities to berth smaller ships and passenger ferries, Port Manatee Executive Director Carlos Buqueras said Tuesday. Asked what impact the study might have on Port Manatee, Buqueras said the state transportation agency is consistent in trying to identify opportunities for the region as ships get larger. "This report is a pre-feasibility study and should FDOT consider it important to move forward to conduct a full feasibility study, this would have the potential to identify additional funding and support for such a project," Buqueras said. "Port Manatee is interested in exploring cruise opportunities consistent with its objective to diversify port revenues, and...is actively exploring the cruise ferry business with an eye towards future Cuba opportunities," he said. -- Do nothing and only receive vessels that fit under the bridge. -- Build a new port seaward of the bridge. -- Replace the Sunshine Skyway Bridge. "It is important to note that FDOT is not recommending one option over another," FDOT officials said. The cruise industry is a significant contributor to the world's economies, with more than $100 billion in economic impact, the study said. While the cruise ship business has grown worldwide, there is a cost in the development of infrastructure to accommodate it that must be addressed, the study said. The immediate outlook for Tampa's cruise business is very positive, with passenger totals approaching one million in the next several years, according to Andy Fobes, public relations director for the Tampa Port Authority. "Long-term, however," Fobes said in a statement, "The height of the bridge, coupled with the ever-increasing vessel size of the world's cruise fleet, will provide significant challenges for Port Tampa Bay's cruise business." LLast year, FDOT commissioned the Miami consulting firm of Bermello Ajamil & Partners to compile the $151,488 Tampa Bay Cruise Port Pre-Feasibility Study. In 2012, cruise line passengers and crews spent more than $7 billion in Florida, and the industry also provides thousands of jobs across the state, the study found. "Florida has long held the distinction of being the No. 1 U.S. cruise state in terms of passenger sailings and economic impacts," according to the study. 07.06.14: editorial - Protect Tampa Bay and cruise ship industry. 07.06.14, tbo.com, With the cruise ship industry now building massive megaships that won’t fit under the Sunshine Skyway Bridge, Port Tampa Bay officials rightly want to explore ways to keep from being squeezed out of the market. 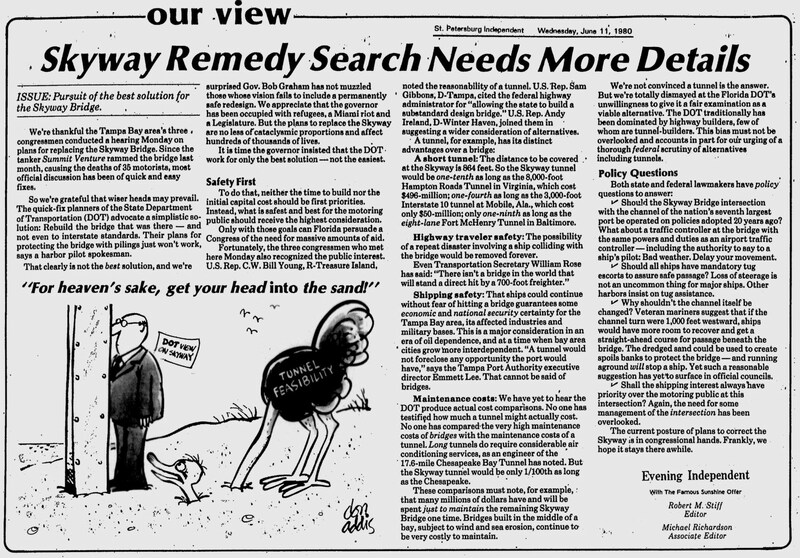 But it’s essential they don’t allow that effort to justify ventures that would wreck Tampa Bay, which after decades of pollution and abuse has made a remarkable comeback. At least one of the proposals that may be considered — the construction of a new cruise ship terminal on submerged land near the mouth of the bay — we fear would be hugely destructive. Tampa Mayor Bob Buckhorn, a member of the Tampa Port Authority, is justifiably worried. “You’re talking about a dredge and fill project in relatively shallow water that’s prime fish habitat. I don’t see how you can do that without tremendous impact,” Buckhorn says. Alas, sometimes in the quest for business, such ecological consequences — which could forever damage the region’s appeal and quality of life — are minimized. The Florida Department of Transportation, in preparing a report for the port on how to deal with the Skyway issue, lists four options: constructing the new terminal in the bay near the Hillsborough-Pinellas line; replacing the Skyway; building a drawbridge at one end of the Skyway with a new channel for the large ships; or doing nothing. Other than doing nothing, all the options likely would have some adverse impact, which is to be expected when maintaining the infrastructure — including channel dredging — necessary for commerce. But when environmental damage is necessary, it’s vital that it be minimized and every precaution be taken against enduring harm. It is not reassuring that DOT officials, in what they call a “pre-feasibility study,” do not address the possibility that the terminal could cause overwhelming damage to Florida’s largest estuary. IIt seems to us this critical resource should have been accorded more concern before proposing projects that might be pursued. TThanks to a coordinated state, local and federal effort over the past 30 years, the bay is in better shape than it has been in generations. Water quality is vastly improved, seagrasses are returning to the once-barren bottom, and fish numbers have rebounded. It would be disgraceful if leaders, in the quest to appease one industry, turned the clock back to the days when Tampa Bay was treated as a worthless dump and it lost more than 80 percent of its seagrass beds and nearly half of its mangrove forests. Without question, the community should strive to sustain and grow its cruise ship industry. As The Tampa Tribune’s Yvette Hammett reports, Tampa’s port served 854,000 passengers in fiscal year 2013, and a report last year found the local cruise ship industry was providing 1,984 jobs and represented $379.7 million in economic activity. Such numbers are the reason Hillsborough County Commissioner Sandy Murman, a member of the Tampa Port Authority, is excited about the potential of a new terminal west of the Skyway. She sees the cruise ship industry as a “tremendous tourist driver” and believes a terminal that would accommodate the larger ships could put passengers’ numbers well over 1 million. Though we’re skeptical, perhaps there is a way to develop a new terminal on the bay’s bottom without causing an environmental disaster. Tampa Bay’s welfare needs to be a central concern as port officials determine their course of action. Buckhorn is dubious that a new terminal would attract much more business. The smaller — the term is relative — cruise ships are not going to suddenly disappear. And Buckhorn wonders if over time the port’s cruise ship facilities might more profitably be transitioned into waterfront residential complexes. There is a lot to study and debate. The port is an economic engine — $15 billion in annual economic impact — and its continued success should be a regional priority. But so should the health of Tampa Bay. Does the old saw "if you build it, they will come" apply when chasing rainbows and hoping to find a chest of gold? 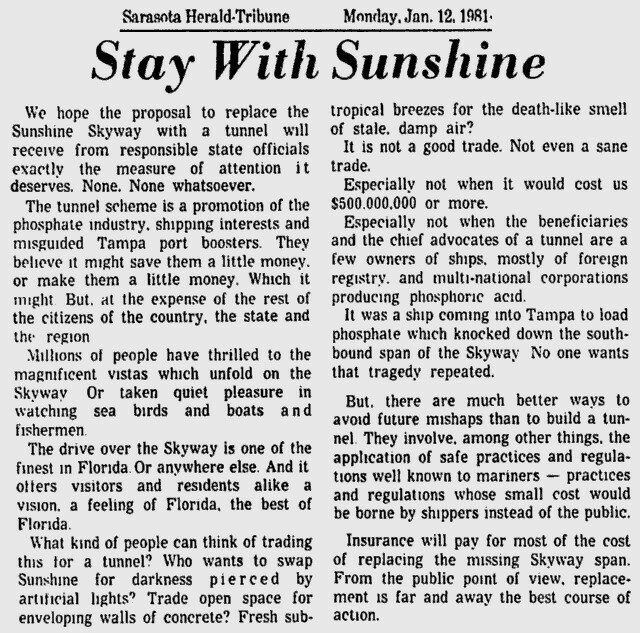 That was our initial take on the very idea of tearing down the Sunshine Skyway Bridge and building a taller one to allow gigantic cruise ships entry into Tampa Bay. That idea would have more appeal if the state's also talking about improving infrastructure to allow access for the new generation of huge container ships -- to Port Manatee. The new Tampa Bay Cruise Port Pre-Feasibility Study focuses on just passenger ships, this a preliminary report commissioned by the state. The mind-numbing cost of ripping out the Skyway and building a new one: an estimated $2 billion. Or, the study outlines, the state could raise the deck of the bridge, at the veritable bargain price of $1.5 billion. A third option, replacing a bridge section, would cost the same. Another one is building a new port west of the Skyway on a manmade island either in Pinellas or Manatee counties, and then ferrying passengers onto the mainland. YYes, the cruise industry is a vital component of both the state and regional economy, with ships currently docking in Tampa. At one time, Port Manatee hosted cruise liners. South Florida hogs the business today. IIf revenue forecasts supercede Tampa Bay infrastructure improvement costs, then by all means let's chase that rainbow. The idea, though seemingly farfetched, is intriguing -- especially if Skyway changes allow the massive cargo ships into Port Manatee. 07.03.14: Mega Cruise Ships and the Sunshine Skyway Bridge. 07.03.14, bradenton.com, Bradenton Herald reporter Sara Kennedy talks with Bay News 9 about a report addressing what to do when cruise ships are too large to sail beneath the Sunshine Skyway Bridge. Video courtesy of Bay News 9. 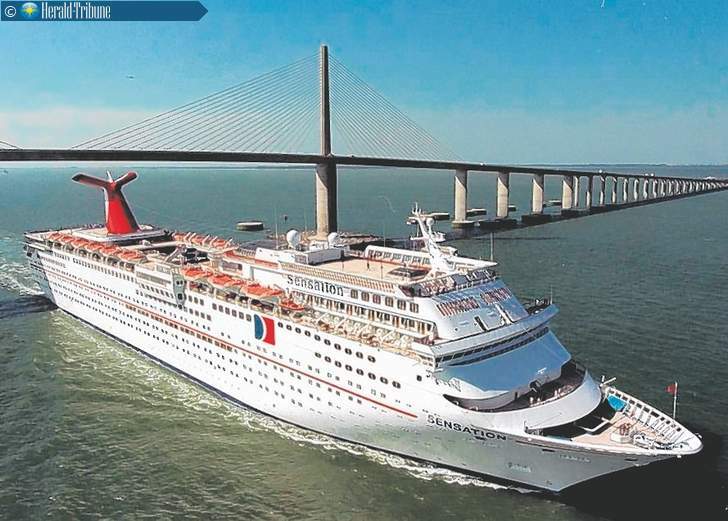 07.03.14: Study offers options to handle cruise ships too big to sail under Skyway. MANATEE -- A draft report addressing what to do when cruise ships are too large to sail beneath the Sunshine Skyway Bridge is designed to "get everyone singing off the same song sheet," a top transportation agency official said Wednesday. "What we want to do is first recognize the Tampa Bay region has an infrastructural limitation to it -- the Skyway Bridge," said Richard Biter, assistant secretary for intermodal system development for the Florida Department of Transportation. The report looks at options Tampa Bay leaders might consider, including those who operate ports at Manatee, St. Petersburg and Tampa, Biter told the Bradenton Herald. "It's a huge impact for the whole region," he added. "If megaships can't get in here, they'll sail someplace else; in all likelihood, Florida will lose out." Competitors for cruise-ship traffic, he said, include Mobile, Ala.; New Orleans; and Galveston, Texas. The preliminary study, expected to be superseded by a final version in a few days, notes the air draft of most new ships now exceeds the height limit of the Sunshine Skyway bridge at 180 feet. • Do nothing and only receive vessels that fit into the present air draft envelope. • Build a new port seaward of the bridge. •• Replace the Sunshine Skyway Bridge. Although Tampa's port is the only local one now hosting cruise ships, Port Manatee is looking at opportunities to berth smaller cruise ships and passenger ferries to ply routes between Manatee County and Cuba, said Executive Director Carlos Buqueras. Asked what the study might mean for Port Manatee, Buqueras said: "It recognizes the importance of the cruise industry to the region as a whole, and to Port Manatee," which at one time did accommodate cruise ships. "The outcome of the report will determine the future of the industry for the area and the investments needed to relocate the cruise industry seaward of the bridge," said Buqueras. "They're looking potentially at both Pinellas County and Manatee County" as possible sites for a new seaward port, built on a manmade island west of the Skyway. The new cruise facility could cost $632 million to $647 million, the study said. Other alternatives include demolishing the Skyway Bridge and building a new one for an estimated $2 billion; raising the deck of the bridge; or demolishing and replacing a bridge section, at a cost of $1.5 billion for each of the latter two options. Asked whether infrastructure projects would be paid for by taxpayers or the cruise industry, Biter said it could be a combination, depending upon the project. "We're not even at the point where we're talking dollars," he said. "It's a prefeasibility study. We're not coming forth with any recommendations. Let's get everybody looking at the same set of facts. It will be up to elected leaders of the Tampa Bay region to come in and say what it is they want to do." A final version of the study will include comments made by port directors across the state. Buqueras said his comments center around forecasting data such as revenue potential, number of passengers in 20 years and capital investments needed to build infrastructure to accommodate giant ships. Last year, FDOT commissioned the Miami consulting firm of Bermello Ajamil & Partners to compile the $151,488 Tampa Bay Cruise Port Pre-Feasibility Study. Cruise line passengers and crews spent more than $7 billion in Florida in 2012, and the industry also provides thousands of jobs across the state, the study found. "Florida has long held the distinction of being the No. 1 U.S. cruise state in terms of passenger sailings and economic impacts," according to the report. South Florida, however, now garners most cruise ship traffic, noted state Rep. Greg Steube, R-Sarasota. "If lawmakers deciding where to appropriate dollars for a project like this -- if we're going to spend this kind of money -- is there going to be a return on the investment for our citizens?" Steube asked. Manatee port officials have been invited with those from Tampa Bay's two other ports to attend a meeting Aug. 13 in St. Petersburg to discuss planning efforts, strategies and investments underway to drive port growth, according to a letter signed by FDOT Secretary Ananth Prasad. The discussion will focus on identifying areas for possible coordination among the three Tampa Bay seaports. 07.01.14: boondoggle idea of the year - raise the skyway or build a new terminal for tampa? The Florida Department of Transportation (FDOT) is about to release its study into whether to raise the Sunshine Skyway Bridge in order to accommodate the newer huge cruise ships which can't fit under the bridge. A Tampa news station reports on the issue in a story entitled "Mega Cruise Ships Present Mega Problems for Tampa." The station says that "officials could do nothing, replace the bridge, build a drawbridge on one side or build a new cruise terminal near the Hillsborough/Pinellas line to avoid it all together." The FDOT is spending over $150,000 of taxpayer money to determine whether it is feasible to raise Skyway Bridge the bridge. The FDOT is also studying whether new cruise ship terminals should be constructed to avoid the the bridge. The Skyway bridge was re-designed after a cargo carrier slammed into it in 1980, toppling a span and killing 35 motorists. It was raised when it was re-built and can still accommodate most cruise ships today. It's a beautiful design, beautifully landscaped, and in outstanding condition. Raising the bridge again would certainly take a couple of years. It would result in stopping all traffic on the bridge or detouring all traffic to one span. This would be a major hassle for commuters crossing from Bradenton to St. Petersburg or from St. Pete to Bradenton. Why should the residents of South Pinellas or North Manatee County be inconvenienced to accommodate a cruise terminal in Hillsborough county? Plus, the project would likely cost over $500,000,000 and as much as $1,000,000,000 (billion). Spending that much money in hope of attracting more passengers from a gigantic ship is a foolhardy adventure especially considering that cities like Mobile, Houston and Norfolk spent tens of millions building new cruise terminals for the cruise lines which left them high and dry. Last year, the Bradenton Herald reported that bridges "have been raised to accommodate ships in the past, but it is a costly and time-consuming process." The newspaper cites the Bayonne Bridge in New York which has been in the slow process of being raised for the past several years at a cost of over $740,000,000. "How about building ships that are appropriately sized to fit ports (and destinations) rather than the push for ever bigger ships, demanding bigger, new and different infrastructure (costs pushed off onto port communities to extent possible). Wouldn't it be grand if all the best ports simply united and said no. This is the maximum we are built for." You can see the Skyway bridge in a photo (above) I took last year from my father-in-law's dock. I say leave the bridge the hell alone. TAMPA (FOX 13) - New, "mega" cruise ships are presenting new, mega problems for Tampa Bay. "The cruise industry- they've got to go where they can take these huge ships," said Sandy Murman, a Tampa Port Authority board member. And as it stands now, Tampa's port isn't an option for these behemoth boats. "We are really constrained by height of Skyway," she said. Conventional ships are already a tight squeeze underneath. Good luck trying to fit the newer generation of vessels. "It's going to be a project we're going to have to embark on," Murman said. Next week the Department of Transportation will release its study with options to deal with the skyway squeeze. Officials could do nothing, replace the bridge, build a drawbridge on one side or build a new cruise terminal near the Hillsborough/Pinellas line to avoid it all together. But, any way you slice it, millions of dollars are at stake. "We're looking at options, listening to the experts. We don't want to be surprised," said Port Tampa Bay Executive Vice President Raul Alfonso. Tourism officials don't want to be surprised either. They're following this closely. "If we can accommodate larger ships with more people, a variety of cruise destination is good for our industry," said Santiago Corrada, president and CEO of Visit Tampa Bay. With so much on the line, local officials agree that doing nothing isn't an option. "We would lose jobs. We would lose economic development; our 1 million cruise passengers would drop," Murman said. 06.30.14: study - skyway to hobble tampa cruise industry. TAMPA — Port Tampa Bay’s cruise ship business could go from thriving to shriveling without a plan to get the newest and largest of these floating cities past the limitations of the Sunshine Skyway. The Florida Department of Transportation is preparing this week to release the results of a study examining four options to address the issue: do nothing, replace the Skyway, build a cruise ship terminal near the Hillsborough-Pinellas county line in Tampa Bay to avoid the bridge issue, or build a drawbridge at one end of the Skyway with a new channel for the giant ships to navigate. The decision will likely be based on return on investment, transportation officials say. And that has yet to be studied. The state agency sanctioned the study in April 2013 to review the options and get input from stakeholders, O’Brien said. The transportation department’s seaport manager, Meredith Dahlrose, would not release the report in draft form last week under a public records request, saying the agency wanted to wait until it had finished compiling stakeholder comments. Hillsborough County Commissioner Sandy Murman, who sits on the Tampa Port Authority Board, said she is eager to see the new study. She said she hopes it finds that the best option for keeping cruise ship business growing here is to build a new cruise ship terminal on submerged lands Hillsborough County owns in Tampa Bay, west of the Skyway. Port Tampa Bay is the eighth-largest cruise port in the U.S., said Andrew Fobes, director of public affairs for the port. He wrote in an email that the area is appealing to cruise ship companies because of its proximity to Caribbean cruise destinations, Tampa International Airport, a strong market in people driving to the port, and the attractions in the area. Fobes said Tampa’s cruise business is robust. Royal Caribbean International will add a second ship in Tampa in November, he said, and AIDA Cruises will use Tampa as a port of call beginning this December. AIDA will bring in a larger vessel the following season. The port served 854,000 cruise passengers in fiscal year 2013 on five ships representing the world’s largest cruise lines: Carnival Cruise Lines, Royal Caribbean International, Holland America Line and Norwegian Cruise Line. A report titled The Local and Regional Economic Impacts of the Port of Tampa, completed in 2013, states that the cruise ship industry was, at the time, providing 1,984 jobs and had a “total value of economic activity” of $379.7 million. Local businesses and suppliers to the cargo and cruise industries at the port, according to the 2013 report, made $933.1 million in local purchases and were responsible for generating $90.9 million in wages and salaries. This is no time to slow down, Murman said. Because Port Tampa Bay is updating its master plan, the timing is ideal, Murman said. O’Brien said any future use of the study’s findings would have to be coordinated with the state Department of Transportation. It is likely that the cruise ships would invest in any new infrastructure built for their benefit. In discussing the issue in 2012 when the Port Authority began studying a Pinellas-area terminal, a Carnival Cruise Line spokesman said Carnival would be interested in a port that avoided the Skyway. He also said it is unlikely that any new Carnival ships would be able to operate from the current Channelside facility. 12.06.13: Tampa Bay facing tough choices to keep cruise ship industry going. TAMPA — The bay area faces three options that will decide the fate of its cruise ship industry: raise the Sunshine Skyway Bridge to allow megacruise ships of the future to pass beneath; build a new cruise terminal west of the bridge for megaships without having them go under the bridge; or do nothing and watch Tampa lose its cruise ship business to ports in New Orleans, Galveston, Houston and Mobile. "Of course, if we do nothing," said Richard Biter, "eventually in 10 to 15 years, it's going to have a significantly negative impact on the cruise ship industry." Biter is the Florida Department of Transportation's assistant secretary for intermodal systems development. His agency has undertaken two studies to look at the future of Florida's cruise ship market — and Tampa Bay's slice of that market. The statewide study was completed in November. The second Tampa Bay-centric study, which was requested by the Port of Tampa, is expected to be finished by month's end. But all the state can do is study these issues, Biter said. It is up to local authorities to decide the fate of cruise ships here, including the Tampa Port Authority, the Manatee County Port Authority and officials in Hillsborough and Pinellas Counties. "The bottom line is it's got to be a local effort," Biter said. "The state is ready and willing to step up and see what we can do. But it's not going to be until everyone here comes together and says we do or don't want (cruise ships)." According to the state, more than half the world's cruise ship fleet will switch to the megaships by 2016-17. The Skyway can handle cruise ships that measure 179 to 181 feet from top to the waterline. But megaships can sit as high as 225 feet above the waterline. "The point is the ships that are currently serving Tampa are eventually going to be rotated out of the fleet," Biter said. "If we look at the market trends throughout the major part of the cruise industry, where they get the greatest return is on the megaships." But one of those options isn't an option: The Skyway cannot be raised. Though some states are raising bridges to accommodate the massive cargo ships of the future, like the Bayonne Bridge in New Jersey, that can't happen here. The Skyway would have to be rebuilt, an incredibly expensive and highly unlikely option that is already off the table. The second option would be to build a cruise ship terminal for the megaships west of the Skyway off the coast of Pinellas or Manatee counties. But that project would require major funding and have to clear numerous environmental hurdles. "Can you do it? Yes," Biter said. "But is it the right thing to do?" Or the bay area could do nothing, Biter said, and try to exist as a niche cruise ship market handling older, smaller ships sailing around the Caribbean. But the megaship problem could still hurt Tampa Bay in the future, Biter said, if the federal government ever allows cruise ships to sail from the United States to Cuba. The Port of Tampa would also be shut out of that potential market as well because of the bridge height issue. Despite the dim future, the local cruise ship market is actually growing. The Tampa Port Authority is adding cruise ships to its portfolio, extended its contract with Carnival Corp. and hopes to surpass 1 million passengers in fiscal year 2015. 179 to 181 feet - The height of cruise ships (from top to the waterline) that the Skyway currently can handle. 225 feet - How high megaships can sit above the waterline. More than half the world's cruise ship fleet will switch to the megaships by 2016-17, according to the state. 12.05.13: Raising Sunshine Skyway Bridge could accommodate jumbo cruise ships. MANATEE -- Raising the Sunshine Skyway Bridge, or building a new port west of it to accommodate cruise ships too large to fit under it now are among the possibilities addressed in a "pre-feasibility" study of Tampa Bay ports. The $151,488 study of ports in Manatee County, St. Petersburg and Tampa will be finished by the end of the year, according to Robin Stublen, spokesman for the Florida Department of Transportation. The largest cruise ships can carry up to 6,400 passengers and 2,000 crew members already, and they're only expected to grow bigger in the future, said Carlos Buqueras, Port Manatee executive director. "A majority of the new cruise ships being constructed today and in the future will not fit under the Skyway Bridge," Stublin emailed to the Herald. "Given the economic impact from the cruise business on the region, the (FDOT) wants to look into possibilities for mitigating possible future negative impacts on the loss of this cruise business in the region, including whether constructing a new terminal outside of the Skyway Bridge, or perhaps even raising the bridge, should be considered." Bridges have been raised to accommodate ships, but it is a costly and time-consuming process. The road bed of Bayonne Bridge in New York, for instance, is being raised 63 feet to 215 feet in a $743.3 million project started several years ago. Asked if the FDOT study contemplates a new port along the west coast of Pinellas County, Stublen said no location has been identified. "If further study is done, all feasible locations west of the Skyway bridge will be considered," he wrote. The study commissioned by FDOT is called the Tampa Bay Cruise Port Pre-Feasibility Study. Port Manatee board members were confused about the study because neither their port nor St. Petersburg's berths cruise ships; only the Port of Tampa does. Port Manatee representatives never asked for the study, and were dismayed by recent visits from FDOT Assistant Secretary Richard Biter, who wanted to discuss port consolidation despite their stated opposition to any merger with their bigger neighbor in Tampa. Local officials told lawmakers Wednesday the port's continued independence is among their top legislative priorities this year and received immediate pledges from two area legislators to support their cause. A. Paul Anderson, Tampa Port Authority director and chief executive officer, could not be reached for comment Wednesday. Asked whether the study was conducted with consolidation in mind, or whether it addresses a separate issue, Stublen e-mailed: "The Department of Transportation, including Assistant Secretary Biter, is not advocating port consolidation. While all of Florida ports are independent entities, the state invests in port projects and has a duty to the taxpayers to ensure those investments bring the best return possible to the region and the state." Tampa Bay ports share a common channel, and are within close proximity, he noted. "Assistant Secretary Biter has spoken with port executives and commissioners from the Tampa Bay region about possible advantages from port cooperation," he wrote. "More coordination of port investments could enhance the ability for Tampa Bay to better compete, as a whole, with other large Gulf markets, such as Mobile and Houston, in attracting new domestic and international business." Biter talked about consolidation as a possible option, but an option nonetheless, along with joint efforts for cooperation, said Buqueras. "The board, in their last action, said they would oppose consolidation, but welcome cooperation," Buqueras added. Buqueras said he knew some of the experts working on the study, performed by the respected firm of Bermello Ajamil & Partners Inc. He said Port Manatee officials also are serving on a statewide committee to help review the study's findings. 01.12.81: tunnel talk, soon after the skyway disaster of 05.09.80. 10.18.80: more tunnel debate. full article. 10.08.80: been down the higher road before. 05.20.80: no one jumps off a tunnel. while having a thriving cruise industry based in tampa bay is a good thing, we hardly expect the taxpayers to be saddled with yet another corporate business, insisting through basic extortion, tax money compensation to satisfy their upgrade demands. this is exactly the same as sport businesses demanding that taxpayers build elaborate game palaces, in order to keep the team in town. if private business entities do not like their current business climate and do not wish to pay for the required upgrades, then we wish them well as they move on to better opportunities. do not try and sell us on how great the return on investment will be, as their projections are always skewed and more times than not, outright fabrications of reality, in favor of lining the pockets of the very proponents of the project. average joe business owners are not granted this prestigious free tax money upgrade option for their businesses. there are too many other infrastructural priorities that need financial attention beforehand. additionally, there seems to be no viable location to build a new port seaward of the bridge, that would not drastically damage the ecosystem that is already in place and in some cases, is already stressed by current environmental issues. ruining established and historic beach areas to placate the cruise industry will not be tolerated by rationally clear thinking people. until the skyway actually needs to be replaced due to age and/or dilapidation, we think the decision should be 'do nothing and only port ships that fit under the bridge', as not all cruise ships will be the colossal monstrosities being discussed here. there will always be smaller cruise ships and tourists that prefer a smaller venue, as opposed to these newer floating cities at sea. the ports of tampa and manatee could well focus on becoming the preferred ports for these smaller ships and market to the tourists that wish to cruise on them. change fort desoto into port desoto. remove all that historical, nature, and park nonsense by covering the whole thing with pavement and build a state-of-the-art cruise portal. there would be plenty of easy access parking, room for huge hotels, a mega-shopping complex, 29 screen movieplex, private beaches for guests only, casinos, and all the other tourist trappings that rake in the big money for cruise tycoons and corrupt politicos. sure, there would be a small fenced in area reserved for the 'fort desoto memorial dog walk', but let's not get too sentimental.